In 1945, my Grandpa wrote a book called The Aftermath. It’s about two survivors — my grandfather and grandmother — trying to find each other after the Holocaust. 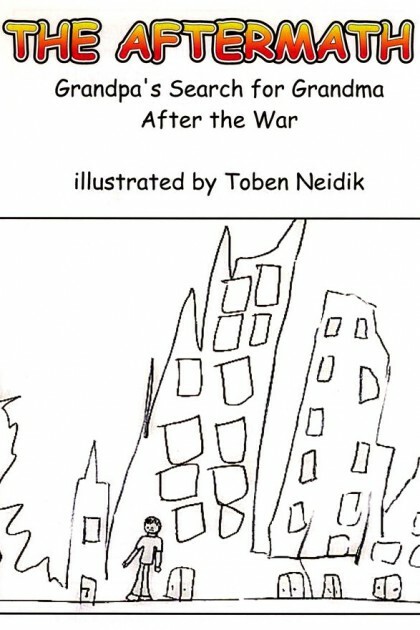 I’ve made a comic book from The Aftermath, as my Bar Mitzvah project. I started by drawing the moments that meant the most to me. Then I did some research and pretty much followed his story. The book starts on the night of the liberation of Dachau. I drew Grandpa lying on a bed of boards. I drew the American army approaching and defeating the Nazis. 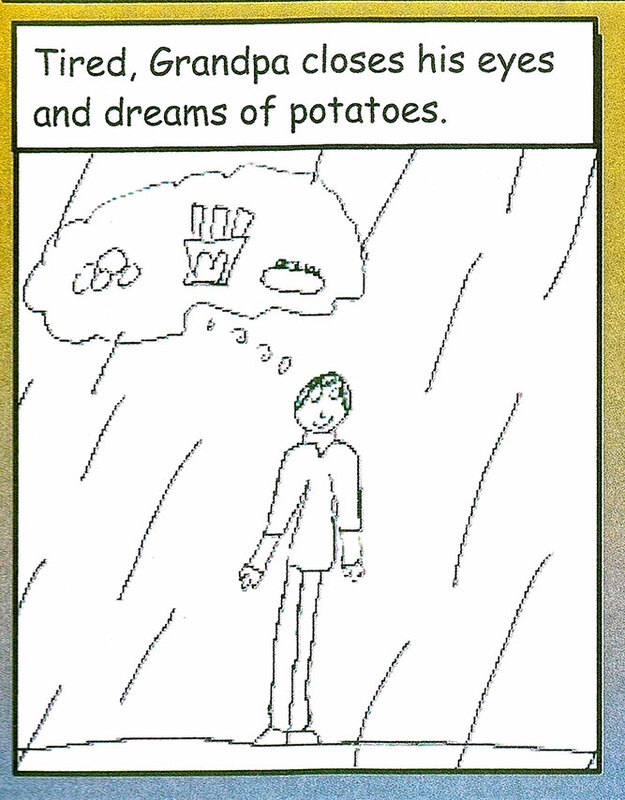 In the days that followed many people die because they are given too much food too fast. But everyone is happy to be free. When Grandpa first leaves the camp, he finds a field of lilacs. I drew him sitting there with an ant, a grasshopper, and a butterfly. He’s lost everything, but he is free. I drew this because it’s such an important moment. He has to decide if he will give up, if he’ll become bitter, or if he’ll rebuild his life. He chooses life. Because Grandpa knows so many languages, he gets a job with the American army. I drew a picture of him walking to work on his first day. He’s skinny and his hair is really short. He’s holding a canteen with a piece of bread in it. That’s all he owns. He knows that everyone in his family was killed, but there’s a small chance that Grandma is alive. Because he works for the army, he gets a car — a Fiat 6. He also gets a passport to travel throughout Europe to look for his wife. 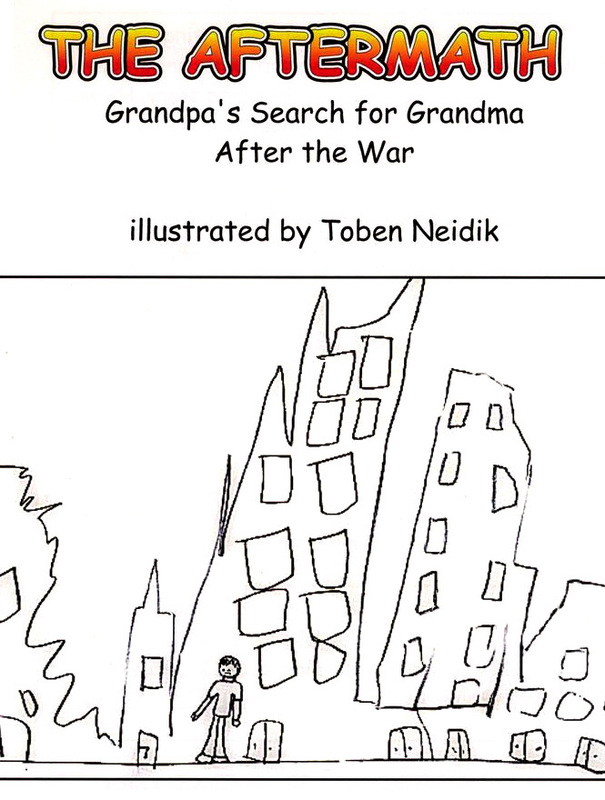 As he describes his search in the book, Grandpa flashes back to life before the war and in the camps. In my comic book, I made the background of the flashbacks in sepia. Before I was born, my parents made a film inspired by The Aftermath and now I’ve made a comic book. I think this is how we remember and how we create something positive from the terrible things that happened. Toben Neidik is creative, imaginative and thinks out of the box. 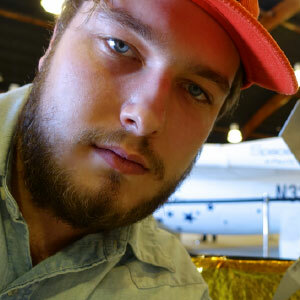 Toben is currently working as a production assistant and photographer for DLI Productions on SpacerRace 2, a feature documentary about the New Space Age. He has also recorded and performed rap songs, which he has written in various clubs and on radio in Montreal. Toben graduated with honours at M.I.N.D., High School, in 2011 where he won the Award for the Best Integrative Project. In 2012, while at Dawson College, The Visual Arts Centre and St. John Bosco School commissioned him to paint a mural on the full back wall of the school. He garnered permission from Warner Bros. to include Looney Tunes in the mural. In 2011, the Centre for Literacy and the Montreal Children’s Hospital commissioned him to make a sign out of Lego for their new “Coin de lecture/Reading Center,” a waiting room for sick children in the lobby of the hospital. While still in high school, The Montreal Gazette published his memorial poem “Cans Rattling in the Night,” in the special year’s end edition “Look Back at 2010. From 2003 to 2010, while in elementary school, Toben created topographically accurate LEGO triptychs of the Mountain: Lac aux castors, The Lookout, and Parc and Jeanne Mance. The triptych has been on display in the Grand Chalet on top of Mount Royal. It was also shown twice at the Smith House, several schools, and the Montreal Children’s Hospital. He was a featured interviewee on CBC Radio “Daybreak” to talk about the first of the models, Beaver Lake, as well as a feature article in the Montreal Mirror. He was invited by Les Amis de la montagne to present the Beaver Lake model to a group of professionals at the colloquium Le Mont Royal, un site recherché. While in elementary school, Toben was the youngest “cinematographer” accredited at the Festival des films du monde for his camerawork he did of his school, which were used n the documentary Unbreakable Minds. He also named the film. 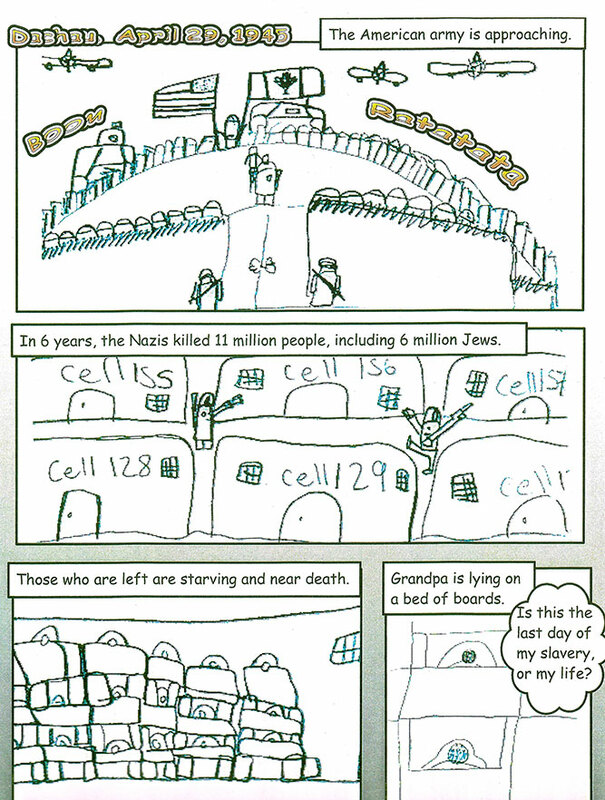 The same year, at the age of twelve, he created a moving graphic novel, The Aftermath based on his grandfather's experiences in the concentration camps. Toben has volunteered at the Friendship Circle to play with children with special needs. He is an accomplished hockey player, and winner of the Montreal City Championship (Bantam A). He is well traveled, loves diversity, as well as film, drawing, photography, visual arts, calligraphy, writing and recording music and rapping.